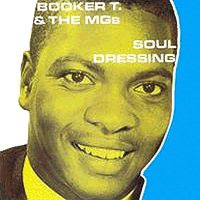 After their surprise instrumental hit "Green Onions" in 1962, Booker T & The MGs found themselves kept busy as Stax Records began to take off. As the label's studio band, they backed R&B artists including Otis Redding, William Bell and both Carla and Rufus Thomas. They released several more instrumental singles of their own through 1963 and 1964, but none of them repeated the success of "Green Onions" - the highest charting was "Tic-Tac-Toe", which only got to #46 R&B. In 1965 a second album was put together, essentially a compilation of the singles released over the last two years with a few extra songs. All songs were band originals with one exception, a cover of Don Covay's "Mercy Mercy". By the time of the album's release original bassist Lewis Steinberg had left, and he was replaced by Donald 'Duck' Dunn. Like the other members of the group, Dunn had performed and recorded a few years back as a member of The Mar-Keys, the original Stax house band from which the MGs had evolved. This gave them their best-known lineup of Booker T. Jones, Steve Cropper, Duck Dunn and Al Jackson, Jr., which would stick together for the next six years and witness the remarkable rise and fall of the Stax empire. What a fantastic treasure trove your blog is!